Hello and welcome to our little corner of the internet. Now that you are here let me try give you some understanding of who we are and how we run our business the way we do….in other words what motivates us and hopefully distinguishes us from other window companies. WindowMasters is owned by Noel Byrne, who has been in the window business for 30 years. Having worked for two of the larger window companies in a sales capacity he decided to put his “neck on the block” and venture out on his own. The main and motivating reason was the feeling that “I could do this better” attitude. Coming from a sales background he understood how vital it was that the whole buying process from that first phone call through to the day the windows and doors were fitted and even afterward need to be a pleasant stress free, friendly process for the customer. The initial reason for taking that leap was born out frustration with what he saw as a lack of proper after sales service. It’s all too easy to make promises to get the sale, but do those promises prove to be simply sales talk when it comes to after sales service…..regrettably in many instances that is the case. We believe very strongly in keeping in touch with our customers, letting them know in a timely manner when their job will be fitted and keeping them informed of any changes that may arise in the planned dates, all it takes is a short phone call!. We approach the process as if we ourselves were the customer and work from that perspective….it’s not “rocket science” as the saying goes. We are acutely aware that “money does not grow on tress” and with that in mind we strive at all times to give informed, friendly, advice without any sales pressure….all sales enquiries are handled by Noel which means he cannot blame anyone when mistakes are made…much and all as he might like to!! While we like to think we have a good in-depth knowledge of this business, we do not claim to know everything and surprise surprise we have been known to make mistakes, but we never ever knowingly give incorrect or untruthful information or advice just for the sake of making a sale…ever! We value our good name and our personal integrity to adopt that approach. 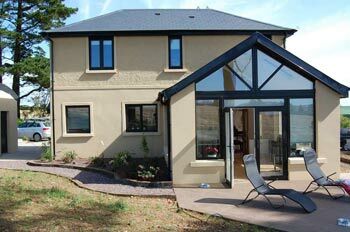 We are not so arrogant as to claim to have the best windows and doors on the market, however we do claim that our windows and doors are as good as anyone’s and better than most. Please give us the opportunity to quote for your work and experience for yourself if any or all of the above is more than sales talk. 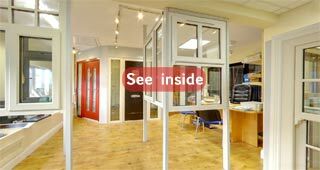 You are very welcome to visit our showroom and see our range of windows, doors and accessories.